Sutter, California, is 50 miles north of Sacramento. It was a pleasant church, quite the contrast to Guide Rock. I drove bus for the school district and worked in Marysville for Montgomery Ward. The church had been established during the 1940s under the leadership of Foy Bryant. A Christian Church shows in the fire maps of 1914 and it was located at the southwest corner of Lyon and Acacia, the main road in from Highway 20. It was one block north of the Methodist Church. Levi Todd, son of A. L. Todd, was a leader there. His family included his wife Etta and children Leo, Emery and Ramons. Mr. Todd and other family members are buried in the local cemetery. 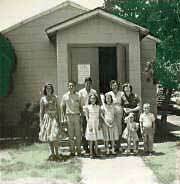 By the time we lived in Sutter, there was no memory of the church in the community. It was gone in every way. Some men and women were baptized into Christ while we lived in Sutter. One case stands out. Louie came to be baptized because he has been raised in a "Christian" home and was baptized because he had completed swimming lessons when a teenager. Even Louie was not satisfied with that. His wife had just become a Christian and his attention was focused on Christianity for a short while. But his life was far from being a focused on the Lord. While I could not refuse to baptize him, I waited until we were in the water and had asked the usual questions about "Who do you say that Jesus is?" He answered correctly. Then just before immersing him I said, "Louie, if you don't mean business this time, I'll just hold you down for a while." His response was decisive: "I mean business." But time proved that I should have held him down. He soon went back to his old life of hypocrasy and double-dealings. I had a friendly debate with Walter Dobbs over the use of the instrument in the church assembly. Leo Yoder was the moderator. That was my first public debate, but not my last. Sometimes we roamed about on Mondays including going to Sacramento to visit Mother Dailey. Lunch with her was very predictable: corned beef hash and applesauce. She kept an ample supply on hand for "emergencies." It was while we lived here that we first became interested in printing because of its potential for reaching out with the Lord's message. We first bought a Kelsey moveable type press, then went on to small office offset presses. This work grew later as we moved north to Vancouver. Our son Charles (Chuck, little Charles) was born at Sutter. He was with with us 16 years and summarily died one day while visiting with a friend at our house. There was never an explanation. The coroner compared it to a crib death. 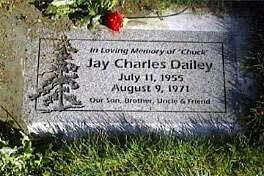 He is buried in Vancouver, Washington, near his aunt Cordie Sharpe and grandmother Dailey. While we lived in Sutter, we were gone for some night-to-night revival meetings in other places. I conducted a meeting at Hayward, California when the church met on Mission Boulevard. Harold Reyman was the preacher at that time. We also held a gospel meeting at the Eastside Church of Christ in Turlock, California when Billy Hughes was the minister. We lived in Sutter for three years. Then, in 1955, I was invited to hold a gospel meeting at Bandon, Oregon by the late Oren Knowlton. Following those two weeks, I spoke on a large rally at the Montavilla Church in Portland. It was during the Bandon meeting that Oren and I wrote The Church in the Bible workbook. It is still in print and is available for do-it-yourself printing from this web site.